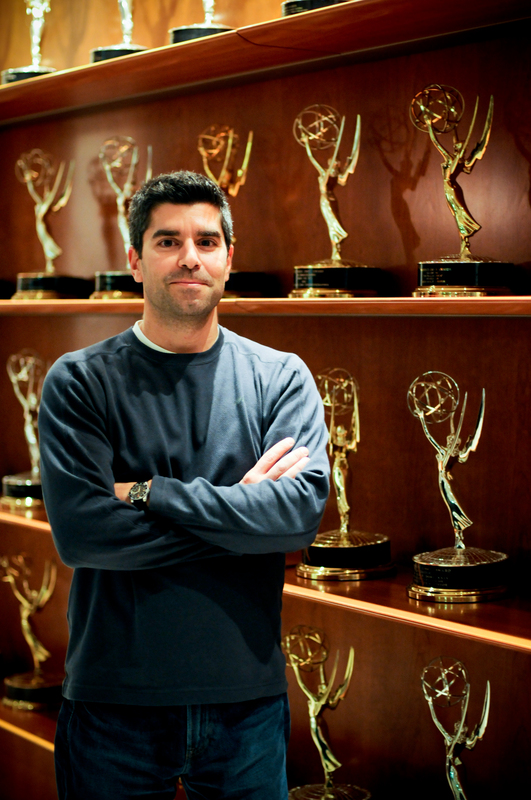 Dave Robidoux has worked at NFL Films since 1991. After starting as an audio engineer, Robidoux worked his way up to music composer and has since won nine Emmy awards with the company. They Call it Pro Football sat down with Robidoux to discuss his career, music composition, and the music department’s development over time. 1. How did you get started as a music composer? Growing up I was in rock bands…the usual thing as a kid growing up in the 80’s. At that time I didn’t know I wanted to be a composer, I was just into playing guitar and writing songs. So I decided to go into a career of music. My high school was really oriented towards music and it put me on the path to go to Berklee College of Music in Boston. I majored in film scoring and from then that’s what led me to this place. 2. How did you get started at NFL Films? I first came in as an intern through the audio department. I knew of NFL Films as I was growing up and I loved the music. So I was really familiar with it, but I didn’t know a way in. Eventually I was hired in the audio department and worked with Tom Hedden, an employee in the department who was hired eight or nine months before me. He was also a composer so the two of us just started writing stuff for some of the producers here on our own time. Eventually it snowballed and snowballed until finally it became so big that both of us became full-time composers. 3. What’s a staff composer? A staff composer is someone whose responsibility is to work with the producer. You can bring your own ideas, styles and musical knowledge to the table but in the end you’re really servicing what the film maker wants his film to be, so it’s probably the hardest thing to learn. You have to be able to interpret what people say, what they feel, and make sure in the end they’re happy and you get across their vision. 4. That leads nicely into my next question…about Steve Sabol. I know he had a really big influence on the big, powerful music that NFL Films made. What was his influence on you and the music department? Steve’s vision of putting together orchestral music with sports images was groundbreaking. We take that as a given now-a-days but that’s when it all started. Steve had a huge influence on me and we worked together a lot. But I think [the company] is still carrying on those same ideas. I think his vision has carried over into the future because of what Steve wanted to make sure was in the music. You know, there’s power, there’s drama, there’s football. You have to somehow capture all that, whether it’s in a rock piece, or an orchestral piece, something has to be there to identify NFL Films and to do that in a way that doesn’t overpower the film. 5. How would you describe the difference between you and Sam Spence? Editor: Sam Spence was NFL Film’s long time composer that preceded Dave Robidoux. I think we’re more similar than most people would think. Steve wanted a great melody and big percussion underneath, which became the staple of NFL Films. I think it’s just the time periods that make us different. I owe everything to Sam and Steve because without either of them I wouldn’t be here. So I’m just trying to carry on what they do, but do it in a unique way. 6. How does the whole process of producing music at NFL Films work? When Sam [Spence] produced it in the early days it was a difficult process to get through but a highly creative and really rewarding one. When I started here it was fundamentally the same way. You talked to producers, you got the ideas you wanted, you went back into your little room and started to bang out melodies and try to get across what they wanted. You’d go back to them, and you would try to show them what your vision was on a piano. You’d go off to the studio and hire a bunch of musicians, and they’d perform it and you’d mix it and you’d go through this whole process for months. You brought it back for the producer and hopefully they loved it but if they didn’t there wasn’t too much they could do about it. Editor: It was nearly impossible to do anything about the music if the producer didn’t like it because the music department would have to travel somewhere to record the orchestra, and would have them for a short period of time. It wouldn’t be economically feasible to travel again and re-record the orchestra. It was really a vague process that required an element of trust on both ends. By 2002, NFL Film’s new complex on 1 Sabol Way was fully operational. Built in was a recording studio, designed specifically to acoustically support an orchestra. These days, the music department no longer has to travel to record orchestras. When computers came in it really allowed us to produce music better and faster. And that’s kind of where we’re at now. We can produce a piece of music very quickly. We’re probably producing about five times the amount we produced fifteen years ago. We can react to things that are going on that week in the NFL. We can react to things that might change over the course of making a film. Hard Knocks is a perfect example. They [the producers] don’t know what they need going into it, but we can react during that whole five-week process to make sure they get it. 7. Would you say that what you guys do is pretty unique compared to other film production companies? We’re unique in how we’re set up. I can just walk upstairs and talk to the producer [I’m working with]. I’ve got a lot of friends that work in other aspects of the entertainment industry and I’m definitely involved in the film-making process earlier than most composers are. But as far as how we produce music and we write it and what I do on a daily basis we’re very in line with what’s going on in Hollywood. 8. So I know that you guys bring in your own orchestra; is that pretty unique? In the TV/Film/Music production business it’s extremely unique. It’s only because of Steve’s vision. He recognized when a human being played an instrument as opposed to on a [synthesizer]. That’s what has kept it here I have to believe. It’s purely a creative decision and the producers recognize the difference. So that’s unbelievably unique because everything related to TV is about budgets and deadlines. We did this project last year which was an animated show on Nickelodeon and [hiring an orchestra] was pretty unique even to those high level guys out in L.A. How long it lasts; we’ll see. It’s getting tighter and tighter. It’s an expensive endeavor to record a real orchestra. 9. When you bring in the orchestra, do you bring it in sections or…how does it work? When we started we used to record the whole orchestra in one room and we’d have to travel for it. One time in London we were forced to move to a different studio which was much smaller. So we did it in sections [of the orchestra] and the thing we noticed was the improved performance. You know, if the trumpet player was playing really high and he nailed it but the French horn player—when they’re all playing together missed it—we’d have to do the take again. We just noticed how quickly we could move and how much less editing we had to do [when we recorded in sections]. From then on we were sold on it and that’s the way we’ve done it ever since. 10. So do you think that it will end at some point in the next decade or so? Here, will it end? I don’t know. I’d like to think no, but I think there will be some type of a compromise on a lot of that. Hopefully we’ll still do it on some of our bigger budget stuff. 11. How often would you say you bring an orchestra in? That varies on our production schedules and everything. Sometimes we’ll have them in two or three times a month, sometimes we’ll go a couple of months without having them in. 12. So are you a conductor while the sessions are going on? When I first started here I conducted a lot of the stuff. Eventually, the process of me running into the control room to listen back and running back out and telling them what was wrong and doing another take and running back into the control room wasn’t working. When you play something you just want feedback quick and for them to hit record again and play it again. 13. If you’re listening to music during your free time, what would you listen to? I listen to everything. Honestly, it sounds like a copout but I’m constantly intrigued by new music. It’s kind of funny, people think that if you write orchestral music you must have listened to just orchestral music, but music is music and influences are everywhere. I’m always into trying things different…just because it has orchestral instruments doesn’t mean it has to play orchestral or classical music. You can have rock influences and different things. I’d like to think that gives you a unique sound. I think that’s what really helped me—I grew up in the 80’s—which is as cheesy as some of that music comes across today, it was really catchy melodies. Those qualities are in every NFL piece. There’s some type of catchy melody, there’s something that’s bombastic and there’s also something that’s overly dramatic…but not in a bad way. So I can listen to lots of different things and get stuff out of it. 14. What instruments do you play these days? Growing up I was a guitar player and I also played drums and bass. I got really proficient at [guitar] but as soon as the composing bug hit me I started writing and I was so intrigued by sounds and melodies and all these kinds of things that eventually I had to make a choice. I’m not Bach and some of these guys that were virtuosic piano players that could write and do all this kind of stuff. Everything is specialized these days so you have to really focus in on what you want to make your thing about. Me, it was composing, I felt it was my voice. You got to make a trade-off, and I kind of traded off continuing to build my guitar chops. I like to think I’m just focused on composing at this point.